Synthetic lubricant oil for bicycles Wet 10.40 is a high viscosity synthetic lubricant with a low friction coefficient. The special additives provide excellent adherence to metal parts and reduce rusting and wear. 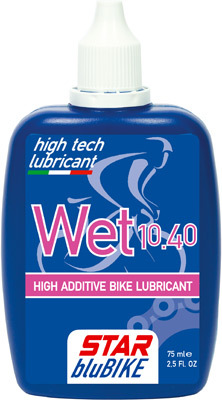 Wet 10.40 guarantees long lasting lubrication. This chain lubricant is ideal for long distances and tough riding conditions especially with high humidity or rain. In dry or dusty conditions, it is recommended to remove excess oil from the chain and to apply X-DRY to avoid dirt contamination. Apply the product to clean, dry chain whileturning the pedals. Avoid contact with brakes.